Aaron Jonckheere turns and squares his thoughts toward the writer across the table. The passionate and painful romance involved in forming a business together may have calloused their emotions, but scratch a little and the evidence of their differences will surface. 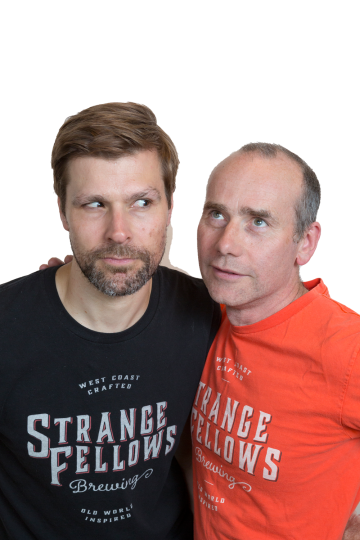 There was a time when it would have been tough to convince a bystander that strangers Iain and Aaron would engage in a fruitful merger, conceiving an offspring as skillfully eccentric as Strange Fellows Brewing. Upon its opening three and a half years ago, the brewery was so instantly accepted that local beer people now often forget how relatively new it still is. Meanwhile, its two founders carry on alike an old married couple, having bonded during a period of courtship beginning three years before their baby was born. “I had been laid off, and I was trotting around with a brewery business plan. I met with a few beer industry people, but nothing was working out.” Aaron was a homebrewer, a hobby he had inherited from his father and grandfather before him. But he needed a ‘real’ brewer to make his dream work. Then he visited Taylor’s Crossing. There, three blocks from his home in the North Vancouver location that now houses Hearthstone Brewery, Aaron met with a gentle man named Dave Varga. “David’s such a great guy”, Aaron relates. “Every time I see him, I’m like, ‘you are amazing’. He took my business plan and spent hours on it. He wrote all these notes. Then he gave it back to me and said ‘By the way, I’m not your guy. But I know a guy, and he might be your guy’. So that is when I got introduced to Iain.” Matchmaker Varga set up the blind date at Iain’s workplace, Mark James Group sister property Yaletown Brewing. Hill, as it happens, is not a Belgian name. The brewer who occasionally gives educational presentations on topics such as sour beers comes by his passion for Low Countries styles by way of exposure to the beers, including travel to Belgium in 1996. No doubt that he would have taken note of his young suitor’s ethnic background. But as a longtime high-profile eligible brewer, Iain had had a number of beaus come calling over the years. He had just recently come out of a serious brewery-planning relationship that had fallen apart. Now it was January 2012, and the jilted Hill was on the rebound. Once the rendezvous was over, Iain went back to work and thought little of it. However, it wasn’t over for Aaron. Asked for his most significant takeaway from the meeting, he concludes, “Iain didn’t say no”. The opportunity to work with Hill wouldn’t have been lost on Jonckheere. Thinking back to his “craft beer epiphany” moments, Iain’s seminal, Belgian-inspired Oud Bruin comes immediately to mind, many years before meeting its creator. Ultimately Aaron shared his business plan, and Iain had a look. He even came over to Aaron’s house. But he wasn’t committed at first. “I had 3 kids, a mortgage, a job that paid me pretty well and gave me a lot of creative license”, Iain recalls. But Jonckheere hung in there. Then, three months into their relationship, there was a moment when Hill finally said, “I’m ready to go forward with this”. The exercise of choosing a viable brand almost ended their relationship. The first name they pegged was the understandable but underwhelming Low Countries Brewing, which stuck around long enough that it became registered and attached to their bank account and cheques. Next came Allegory, which might have worked well had it not conflicted with a South American winery. Looking for inspiration, they gathered together a group of beer geeks and ran a market research focus group, but the two potential partners just couldn’t agree on a name from the fairly long shortlist it provided. “I can’t overstate it: that was hell”, Aaron relates. So he and his wife went over to the Hills’ for dinner and brought five names to compare with the five favoured by Iain and his wife Christine. “We present the names. There’s no agreement. We don’t overlap on anything” he remembers wistfully. Witnessing their awkward inability to deal with this fundamental challenge, Christine remarked that her husband and friend were a couple of ‘strange dudes’. 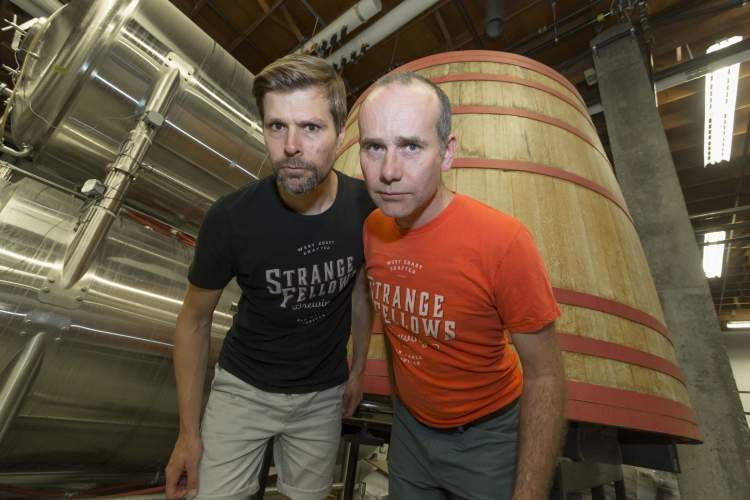 Something about that comment twigged, and over the course of a week or two they solidified the name Strange Fellows—a perfect evocation of their identity. As for the distinctive design of their brand, it’s the work of the person who inspired their name. Iain recalls suggesting in his very first meeting with Aaron that if they had a brewery together, he’d want Christine, a longtime visual artist, to design the logo and graphics. “Turns out she does a pretty good job” he understates, triggering chuckles of appreciation for their well-defined visual identity amongst those gathered. Another important piece of the puzzle was their spacious facility, a former carpet warehouse. One day early in the process, Iain had picked up the phone to call Graham With of Parallel 49 Brewing. “By accident, I called this guy named Graham [Disher] who was a general contractor who used to work for Mark James. I was in this headspace where I was talking to a few people about things. I went out on a ledge and said, “Hey, this might be happening.” Next thing you know, Iain and Aaron had a major investor who helped build their brewhouse. Some of their trial and error is publicly documented for posterity on a WordPress blog that Aaron had set up early on. Google ‘Starting A Craft Brewery’, and you’ll probably find it at the top of your search results. It’s been a valued resource to many, and still enjoys about 5000 views per month to this day. “You hope for the best, and you plan for the worst”, Jonckheere concludes. “We’re all different. It’s about being open to new things in the world. 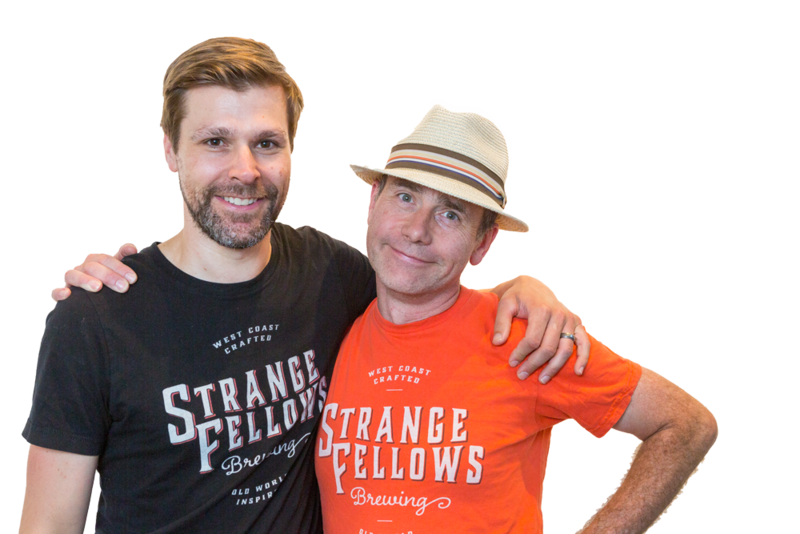 What Strange Fellows has become about is sharing your differences over a beer respectfully.” Something Iain and Aaron apparently managed to do long enough to turn each other’s long-held dream into a reality better than they each might have imagined. 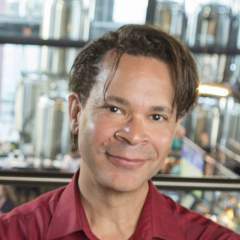 Editor of What's Brewing, BC columnist for Northwest Brewing News. Contributor to The Publican, BC Ale Trail and Beer Me BC. Accredited Member of the BC Association of Travel Writers. Craft beer fan since the late 1990s, CAMRA BC member since 2004. Along with wife Ivana, he travels Cascadia as half of the beer duo BeerSeekers.